Some recipes request that you scoop out most of the cooked potato before pan-frying them, but we do not think that is necessary. In our opinion the more potato there is, the better things are balanced out between the rich toppings and buttery, crispy crust. They turn out best with small to medium sized potatoes (which are currently in season here in N.C.!) although any size will work. Other toppings as desired: cheese, sour cream, bacon/proscuitto, onions, etc. 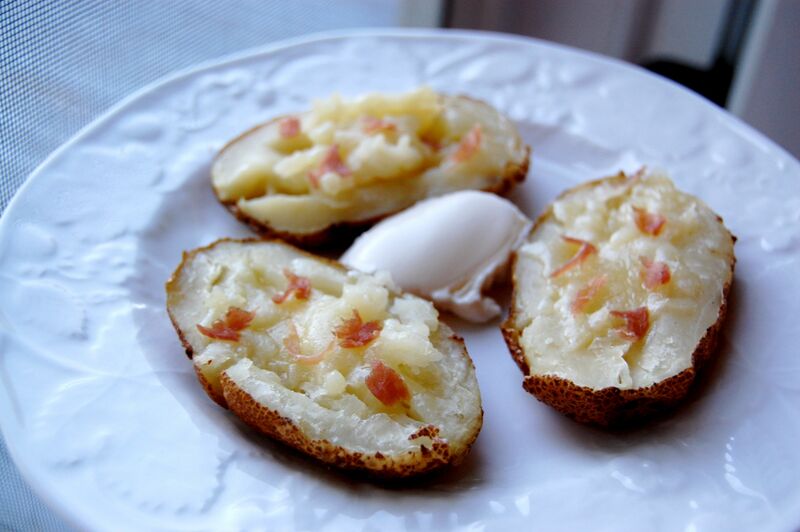 Bake (or microwave) the potatoes until tender when pierced with a fork. Slice them in half lengthwise. Mash the cut sides with a fork to break up and flatten out the potato a little. Add salt and pepper along with any other desired toppings. Melt 2 – 3 tablespoons butter in a large sauté pan over medium-high heat. Stick the potatoes in (skin side down) and fry until bottoms are brown and crispy. It should take 5 – 10 minutes. This is a deliciously easy recipe. My oldest son doesn’t really eat potatoes, I bet he would try this one. I encourage you to check out the book Nourishing Traditions by Sally Fallon. She has some amazing information about milk and butter and butterfat in her introduction. It is definitely not something to be afraid of, especially considering that each serving has less than a tablespoon. Fallon writes about the role of saturated fat in the diet, and her opinion is that modern nutritionists have misunderstood this important nutrient. Butter is an especially rich source of saturated fat and other micronutrients. You are already eating grass fed butter, and that is her biggest stipulation. The idea that saturated fat is healthy in the correct amounts and that fat doesn’t make you fat are the hardest bits of “nutritionism” dogma to break. But my family eats about a stick or more of butter every week, and all four of us are healthy and skinny.What we don’t eat is too much wheat and sugar. Besides that Fallon has some amazing traditional recipes. I especially like some of the fermented beverages and the bone broths which give a huge amount of nutrition for relatively little money. Hi! I follow your blog also btw – it’s great! I’ve recently become more aware of saturated fast due to some blood test results. What amazes me is that I’ve drastically improved the way I eat over the past year. I’m talking – going from eating highly processed junk food and fast food at least 2-3 times a week, to eating that maybe once a month, if that. We eat tons of vegetables that we get from a local CSA and I was shocked when I got my blood results that said I had very high bad cholesterol and very low good cholesterol. My overall cholesterol was normal. I’m attributing my bad cholesterol to the fact that we have been eating a lot of eggs and cheese. So i’ve greatly reduced those items. I just mention it because you said you are healthy and skinny – which you may “feel” healthy, but I reccommend getting blood tests because you never know! I hope you don’t take this the wrong way, I’m not trying to call you out – just want to share my experience. Thanks for the comment! Have you been retested since you started reducing your egg and cheese consumption? Just curious if that helped change things for you? And I agree you can never replace a good ol’ blood test from the doctor just to know how you are doing for sure! Thanks for the tip on the book! I would love to learn more on butter, oil, and using fats in general. I agree the whole “low-fat” diet is just a big hoax – it is just sometimes hard to reprogram ourselves!